Carlyle Dental offers periodontal therapy for residents living in Kinston, Goldsboro, Greenville and the surrounding areas of North Carolina. Periodontal diseases, including gingivitis and periodontitis (“Pyarea”) , are serious, chronic infections that occur when the bacteria in plaque builds up, causing the gums to become inflamed and infected. Some individuals are more susceptible than others, and the body’s ability to fight oral bacterial infection can vary over time. Periodontal therapy becomes necessary for residents of Kinston, NC and Greenville, NC when the lining of the gum tissue becomes infected. If left untreated, this gum infection will ultimately result in tooth loss. Periodontal infection is not curable, but it can be treated and controlled. If detected early, non-surgical periodontal therapy is available. Gingivitis, the mildest form of periodontal disease, is caused by poor dental hygiene and is characterized by swollen, red gums that bleed easily. The condition can be reversed with a combination of good oral care and professional treatment. If it remains untreated, however, gingivitis will eventually progress into periodontitis. There are several different forms of periodontitis, but they all begin when the oral bacteria stimulate a chronic inflammatory response in the gums, causing tissue and bone that support the teeth to break down and die. Gums will then separate from the teeth, leaving gaps that become infected and deepen, causing further destruction of bone and gum tissue. Eventually, teeth become loose and may need to be extracted altogether. Treatment options include scaling and root planing, which clean root surfaces and remove plaque and tartar from the periodontal gaps. Ultrasonics can reduce bacteria and toxins to acceptable levels, so that the immune system can then take over and manage them. Antimicrobial medicines can also be used to irrigate under the gum line, and lasers may even be used for some periodontal therapies. 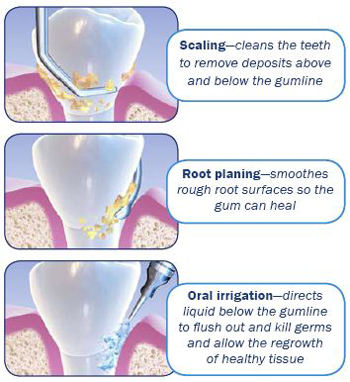 If the gum tissue is too unhealthy to be repaired by any of these methods, surgery may be prescribed. Pocket reduction, regenerative procedures, dental crown lengthening, and gum graft surgery are all surgical options that treat periodontal disease, and can improve the aesthetics of the gum line. Once your periodontal therapy treatment is complete, Carlyle Dental will educate you in ways to control the infection and to continue effective bacteria removal at home. The most important periodontal therapy for residents in Kinston, NC and Greenville, NC is that of preventative treatment. Regular dental visits will monitor the state of your oral health, and will ensure that gum disease can be identified and treated in its early stages. How Much Does Periodontal Therapy Cost in Kinston, NC? The cost for periodontal therapy varies and depends on the extent of treatment necessary. We accept cash, MasterCard, Visa, and personal checks. Insurance is accepted, and we also have financing available through CareCredit® and Compassionate Healthcare Services®. Set up a consultation at Carlyle Dental today by calling 252-624-9698. Spots fill quickly, so call or schedule an appointment by filling out Carlyle’s convenient online form at your earliest convenience. Carlyle Dental is the first choice in dental care for residents living in Kinston, Goldsboro, Greenville and the surrounding areas of North Carolina.